The Tankless Gas Water heater is a topic of much debate when it comes to the remodeling of a newly constructed house. This water heater is an ideal choice for those who want to save space and energy and are looking for a technological appliance that can replace their bulky water tank. The tankless type of water heater provides instant hot water. It fits the needs of most families as they don’t have to worry that the water in the tank will run out. There is no tank for water storage in these heaters, so energy isn’t constantly required to keep the water warm. The mechanism of a tankless water heater is a bit complicated as fixed heaters are pre-installed which allow the water to heat up the instant a faucet is turned on. Tankless water heaters are widely preferred for installation at home because of their energy-efficient use. Below are some of the specifications of the tankless gas water heater to help you make the right choice. A tankless gas water heater is a good choice when it comes to small sized apartments as they prove to be a good replacement of the hefty tanks which tend to take up too much space. As the tankless water heater does not require the constant use of power to keep the water warm in the storage tank, it saves energy and consequently saves money on the utility bills at the end of the month. People who have installed this type of water heater highly recommend them as they are power savers and help maintain the budget. They also prevent the standby heat loss, unlike conventional tank heaters. Also, in tank type water heaters, if the water isn’t used for a while, it has to be flushed as it can create smell and sedimentation. And no one wants to have to deal with that. Apart from the low power consumption in these water heaters, they are also highly durable. The heaters have no storage tank, so the maintenance issues like corrosion, sediment build-up, and leakages don’t usually arise. These heaters are designed to save money by cutting the costs of maintenance and repairs which conventional heaters demand at least once a year. The tankless gas water heaters are eco-friendly as they reduce carbon emissions to a great extent. It is estimated that water heaters consume almost 20% of the energy budget at an average home in the US. This can easily be avoided by replacing these heaters with their tankless-gas version. The eco-friendliness of the product is a big advantage for people who wish to go green. One of the biggest perquisites of the tankless gas water heaters is that they offer long term warranty for users. Many of the consumers believe that these water heaters can last up to 15 to 20 years if they are not roughly used. As these heaters don’t get clogging issues and leakage problems, the tankless heaters are much more reliable than the conventional water heaters. The durability of this water heater compared to the conventional water heater is considerably higher than other heaters. These types of water heaters are an ideal choice for large households. This is because there is no tank water to run short when many people are using it. Also there is no stand-by heat loss to retain the hot water in a tank, so these heaters never run out of hot water. However, the capacities of these heaters differ with respect to the brand. Thus, if you are purchasing one for a large household, ensure that the capacity can handle how often it will be used. 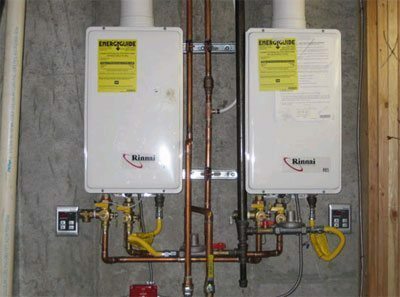 The tankless type of water heater can be costly at the time of installation. This is the reason why many people go for the tank model. The people who choose to go for tankless water heaters while remodeling their house have to re-wire. This is a hectic and costly mechanism requiring a highly efficient plumber. Thus, we can say that the gas tankless water heater is a one-time cost. However, it can help save a lot in the longer run. The one-time installation cost will be cheaper than all the repairs and maintenance that a tank water heater would require. When choosing which type water heater to install, ensure you look at long-term benefits, and not just the immediate ones. Essentially, tank water heaters will present more long-term problems. It will eventually not be worth all the money you’re spending to maintain it. If you are convinced of the usability of these heaters, make sure to compare the reviews and specifications of tankless heaters available in the market before purchase.